The Pied Heron is a small dark blue-grey and white bird with a crest plumes. The crest plumes, back plumes and neck plumes are all longer during breeding. Juveniles lack the dark cap and can be mistaken for White-necked Heron (though a much larger bird) if not familiar with both species. 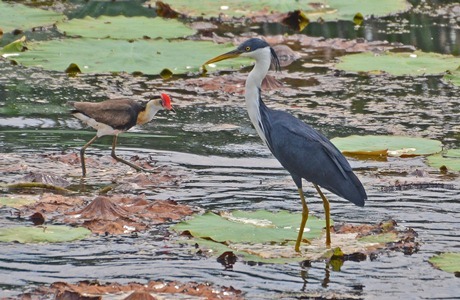 Pied Heron range across northern Australia, New Guinea and Indonesia. Insects, fish and frogs. It used ‘foot stirring’, snatches fish while flying over the water and scavenges at dumps and picnic areas. It is a regular at sewerage treatment plants, feeding on insects attracted by high nutrients. Nesting in mixed colonies mostly in mangroves, building their nest low in a tree. They breed in January to April. Habitat – Freshwater swamps, billabongs, dumps and sewerage ponds. They range across northern Australia, New Guinea and Indonesia. 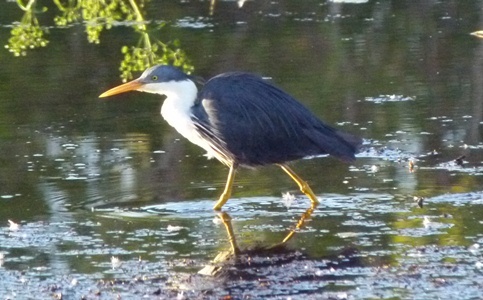 There are 23 known Pied Heron rookeries in the Top End and the breeding population has been estimated to be 22,600. Although common in the north, this is a species not seen down south so visitors will relish the opportunity to get good views of them. They are seen flying over Darwin in large flocks on dawn and dusk, moving between roosting and feeding grounds.